Kenn Kaufman informed us that the internet isn’t a reliable source based on his informal survey that determined nearly all the bird information there is incorrect or incomplete – Holy crap, I hope he didn’t read my explanation of how the Ibis got its name. On a side note, Hummingbirds mate in the air upside down while flying backwards. Don and Lillian Stokes mentioned that Ding Darling National Wildlife Refuge is a good place to find Mangrove Cuckoos. They actually had some funny tips on how to locate this bird – one being never say its name and another being take someone that has never heard of one instead of someone who has unsuccessfully tried for years (the latter likely being cursed) – in case you are wondering, these are the authors for my Stokes Field Guide which I really like. Oh sure, Dave Jasper comes back and recommends wearing white to draw waterfowl in closer. Mel White provides an etiquette tip for not belittling other people’s cherished finds. Jeffrey Bouton recommends hitting Padre Island in late April and early May – must say early Jan is quite nice as well. Sigh, cats are not bird killers–it’s just that birds are too trusting of others, naive really, and what’s a cat to do? Thanks for the review–I’ll probably flip through the book, but now I know it will be a fast read. 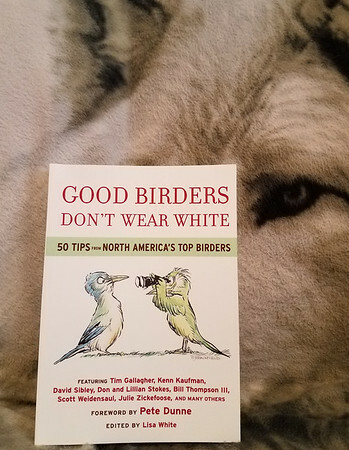 I had heard about not wearing white–in fact, that you can wear any color at all except white–from other birders. My own theory is that the brighteners in washing machine detergents (at one time, phosphorus, which was great) cause whites to glow in the UV just like under blacklights, and birds can see in the ultraviolet and this freaks them out. But I don’t know. I thought I had a Mangrove Cuckoo in Fort Myers a year ago, but it turned out when processing the pictures to be a Yellow-Billed Cuckoo. Nothing to sneeze at, but I have gotten pics of those up here where there are no mangroves. Birds do not come to people, you have to seek them out. Look for YouTube videos on pishing to see exactly how it sounds (OK, like “pish”). I try it sometimes–it may help, I’m not sure, mostly it doesn’t and I feel like an idiot. Thanks for taking the time to review this book! Based on this, I’m going to pull my car up to the next birding field trip in my area, open my windows, pop one of my Stokes bird song CDs in my car stereo, and crank it up to 11. Then I’ll swagger out of the car dressed like Rodney Dangerfield in Caddyshack and start insulting the women and men and birds. “Oh, this your wife, huh? A lovely lady. Hey baby, you must’ve been something before Audubon.” All because I read your review. I think your comment might actually be longer than my post – thnx! I just surveyed 100 birds and 99-1 said cats are killers and need to be forcibly removed from all homes. Pretty sure that other one was just a cat in a bird disguise. Interesting enough, it appears the birds around here have to be more worried about Cooper’s Hawks. Last week I watched one fly into my backyard and land on a branch about 75 feet from my feeders. I grabbed the camera because it had the makings of some good shots. It flew into a clump a trees closer to the feeders and that is when I lost it. Thinking it was gone, I gave up and went back to my original task. About 30 minutes later I see that Cooper go dive bombing right through the feeders grasping at whatever it could get close to – it would have been successful, but two Crows were sitting off to the side and got spooked – the little birds scattered, but both Crows took out after the Cooper causing it to redirect away. Interesting perspective on the white shirts and phosphorous. Never thought of that before. Sorry to hear about the Mangrove (wink) – best of luck next time – meanwhile it might be time for a trip down there myself hehehe. I though you might think that stereo tip was a bit rude – however, now I am going to think of Caddyshack every time I go birding with you. Oh, and DO NOT mention you got that idea from reading MY review. Interesting note, I was talking to someone this week that had no idea what the reference was regarding going to 11 – my age none the less – I was stunned. Hey, thanks for taking the time to comment – appreciate it.